The AMD A10-6800K is a desktop APU from the Richland series. The chip is produced ​​in a 32nm process and integrates 2 modules with 4 CPU cores clocked at 4.1 to 4.4 GHz. Furthermore, the 6800K has a Radeon HD 8670D graphics unit and a DDR3-2133 memory controller. Due to the unlocked multiplier, the CPU can overclock very easily. Compared to the previous Trinity generation A10-5800K, the 6800K offers higher clocked CPU and GPU cores and supports higher clocked main memory. Otherwise, only small optimizations regarding power and turbo were made. The CPU cores are based on a reworked Bulldozer architecture called Piledriver. Although marketed as a quad-core processor, the A10-6800K includes only two modules with four integer-cores and two floating-point units in total. As a result, the CPU is not a true quad-core processor. Depending on the benchmark, the CPU performance of the A10-6800K is slightly faster than the old A10-5800K due to the higher clock rates (same architecture). 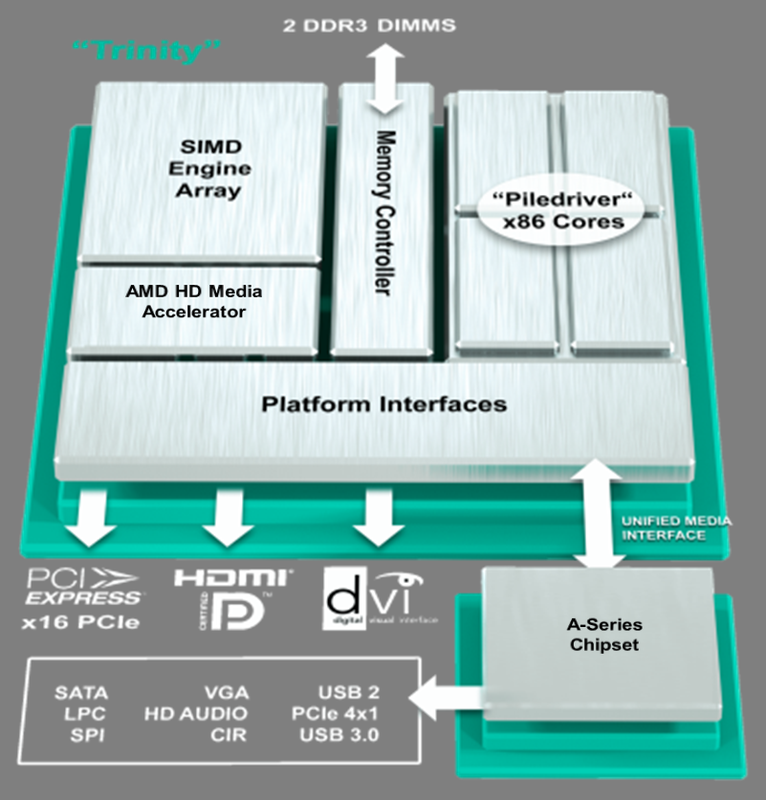 Therefore, it is similar to Ivy Bridge Core i3 CPUs. The chip shows good performance on applications with high parallelization, whereas performance per thread is less impressive. For everyday tasks like Office, multimedia applications or Internet surfing, the 5800K is suitable without restrictions; even demanding 3D games are possible if paired with a dedicated graphics card. The integrated DirectX 11-compatible Radeon HD 8670D offers all 384 shader cores of the Richland chip and a core clock of 844 MHz with no Turbo support. The power consumption of the entire desktop APU is rated at 100 Watts.